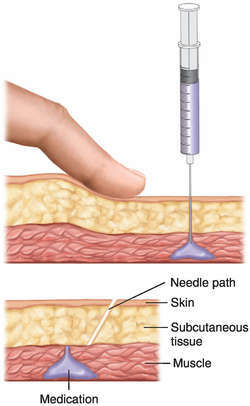 a technique for intramuscular injection of a substance likely to be irritating, or when deposition of a drug and absorption by muscle tissue is crucial. The tissue to be injected is pulled downward and in the direction of the body's midline. It is held in this position during the time and after the drug is injected. When the tissue is released, the usually straight needle track will become a broken line similar to the letter Z. This holds the medication deep in the muscle and prevents upward seepage through the tissues along the needle track. The area is not massaged after injection. A separate needle is used after drawing up the drug into the syringe. This eliminates depositing the drug along the needle track while it is piercing the tissue.